- The modern Domino glass ceramic cooktop for more cooking pleasure and less cleaning effort. 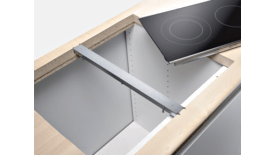 - The 30 cm wide cooktop is ideal for combining with other Domino or faceted design cooktops. - touchSlider control allows to control the temperature by entering it directly or by moving the slider with a single finger. - The timer with switch-off function safely shuts off the cooking zone when the selected cooking time expires. Individual pleasure in cooking: domino hobs. The 30- and 40-cm-wide dominos can be combined as you wish, e.g. ceramic induction cooking hobs with a gas wok hob. A lava grill and a deep fryer are also available. The dominos can be assembled for a perfect look to your hob.